Of Horses and Men: Yeehaw!! Last night went to the barn and it was very windy and fall like temps, like in the 60's. Perfect riding weather. I was feeling brave from watching all of the olympics and stuff so I decided to really hike up one of the jumps to make a 4ft 3in vertical at the beginning of a diagonal line. We had gotten a lot of rain that morning so the corners were a little slick so had to go slow in the corners and gain some speed and pace on the straightaway before the jump. Possum warmed up great and we did some little practice jumps and getting him all ready. Then I pointed him to the big airy vertical and he went over it completely in stride. Now being a 15.3H appaloosa who is built downhill and not "made" for jumping he was a superstar. My eye was also right on last night so that helped to pilot him to a good spot. I was amazed at how well he did especially in the iffy footing. We sailed over it about 10 times and he only knocked it twice, and only the top rail and once was my fault for taking a big spot. I really wanted to end on a good note and I could tell that he was getting tired. I gave him a little break and we circled and went for it. I saw my spot and he saw it too, I gave a "heyah". He knew right what that meant and rounded his back and tucked his legs up so much that it basically jumped me out of the tack and I lost my right stirrup. It was amazing to feel all that power. My friend told me that he cleared it by a lot. I gave him lots of pats and a good cool down and grooming and turned him out for some grass. I was just so proud of us yesterday. This horse that came from the meat truck, man killer and starved and look at what he is doing now!! That totally made my night. On the men side of things, "G" is talking to me some over texts and being decent. Who knows what the future will bring with that. 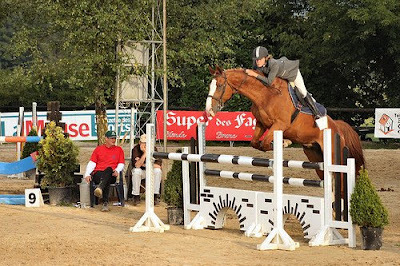 Above is a pic of a jump at around 4ft to give you a visual, which is also level 6 in jumpers. Do I think we're ready for a course that big, NO, but slowly and shurely we're getting there. Have a great day everyone. Feeling kinda sick today so hoping to make it through with little stress and just chill tonight. * Also for a challenge, can my little jumping students pick out flaws in rider position and horse movement from the above pic? There are some startling flaws to see and maybe we can talk about it tomorrow. Ok - that picture - weak legs - the person's legs are waaaay back and it looks like she could fall pretty easily. She also looks way too forward on the horse's neck... just my guesses! OH OH - Her feet are way back! And it looks like her feet are too far into the stirrups and heels are not down - about the first half?? My eye is not developed enough - is her face not too close to the horse's neck? Is she late in the release? Just to help a little, she is jumping waaaaaay ahead of her horse. Her stirrups are too long as you can see she not only has a straight leg but that it has swung far past the girth. It looks like they got a close spot to this fence, due to the horses horrible looking front end. If not, this horse is a dangerous jumper with legs hanging like that. His front legs should be up and forward reaching and not trailing behind. Oh, and way to go, Possum! Ha! I got it right!! Her legs are too straight and she's too far up on the horse's neck! (happy dancing!) I didn't notice the horse's front legs until you pointed it out, though. See? I'm teachable! Well it's too late for me to play now, but I was going to say the same thing as everyone else...lol!!! Glad that you are having a good time with Possum...at least your riding doesn't suffer when you are. It's always so easy to dole out relationship advice, so I won't, but let me just say that I hope "G" doesn't keep you hanging for too long...you seem like you deserve better! Again...easy for me to say when I am not the one having issues. Possum sounds like such a fantastic horse. Glad you two are having such a great time together, and expanding your horizons! As to "G".... Honey, been there, done that. Really seriously think about it, learn from it, and be ready to Live Your Life To The FULLEST. Thanks everyone for your kind words and encouragement, I really appreciate it. ALl we need to do is take one day at a time, keep breathing and try and be happy. The rest will fall into place, but it's damn hard sometimes waiting for it to happen!